People say we are survivors but I don’t see us as survivors of anything. We are still here, there’s nothing that’s come and tried to dislodge us. We just go about our business. 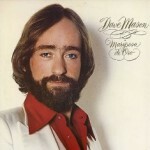 David Thomas "Dave" Mason is an English singer-songwriter, and guitarist from Worcester, who first found fame with the rock band Traffic. In his long career, Mason has played and recorded with many of the era's most notable rock musicians, including Jimi Hendrix, Delaney Bramlett, Michael Jackson, The Rolling Stones, Eric Clapton, George Harrison, Fleetwood Mac and Cass Elliot.